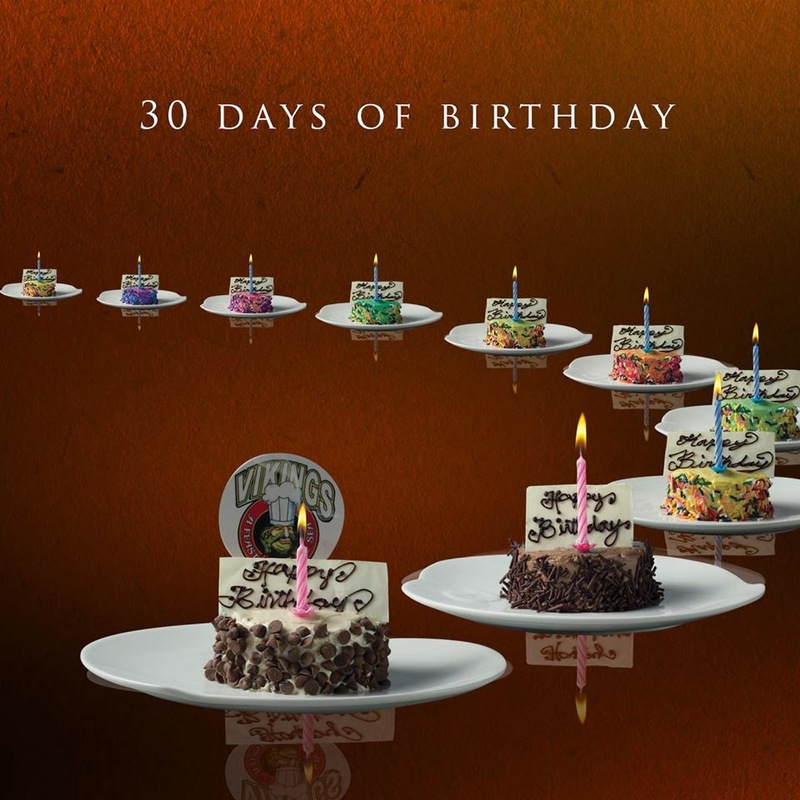 At Vikings, you can celebrate and eat for FREE not just once, but 30 more times on your birthday! 1) Birthday celebrator of all ages can avail the birthday promo on the day itself and on their birthday month. Celebrators can eat for FREE ON THE DAY of their birthday on both lunch and dinner, as long as accompanied by ONE FULL PAYING ADULT. Celebrators can eat for FREE for ONE MONTH on both lunch and dinner per day, as long as it is within the month of his/her birthday and accompanied by FOUR FULL PAYING ADULT. 2) One full paying adult are adult guests who will be paying full rate without any discounts. 3.) Requirements for Celebrants: Celebrant must bring an ORIGINAL and VALID government issued picture I.D. with the birthdate imprinted on it, both local and foreign I.D.s are accepted, for proof (such as S.S.S., N.B.I., Driver’s License, Pag-Ibig, P.R.C., Barangay, Unified, Police Clearance I.D. and Passport) In the case that the celebrant doesn’t have a government issued picture I.D., he/she may bring his/her birth certificate supported by any picture I.D. (school I.D., parent’s I.D., company I.D.). 4.) This promo can’t be used in conjunction with our current promotions or discounts. 5.) This promo can’t be used in conjunction with our current promotions or discounts. Birthday promo the day of birthday will be free if accompanied by 1person with full payment is still available for this year 2017 ??? What if there's only one full-paying adult for two birthday celebrants? Only 1 birthday celebrator can avail of the promo. The other one should "coerce" someone (haha) to join him/her and pay the full buffet price so that she could avail of the free buffet. Anyway, it's his/her birthday, di ba? What if there's three full-paying adult for two birthday celebrants? Pwede po on walk in clients yung promo or sa may reservation lang? Hi, how about hes birthday was last week, can he avail a birthday promo pa rin??? Good morning what if we were 2 the other 1 is the celebrant can we avail is the celebrant free and 1 is the payung am i right? Hi, I've never been to Vikings so I'm a bit confused. Do I need to pay a downpayment for my reservation to be effective? If not, do I pay at arrival or after we eat, just like normal restaurants where you call the waiter for the bill? Thank you in advance! For the birthday promo, you don't need to pay a downpayment, just pay when you get your bill. But reservations are encouraged so that you don't need to queue. Then, once you get to your table, you need to advise the attendant that you will avail of the birthday promo. Hi! We've never been in Vikings. We're planning to go there this week and we have a birthday celebrant. We will use vikings' voucher. Is it okay to use it? Because as you said, the celebrator can eat as long as accompanied by 1 full paying adult. Thanks! Hello. What if the bday celebrants are twins? Can we have the 2 free on the day of their birthday? (Coz we want to be on the same table) thanks. Yes, I think so.. 1 bday celebrator + 1 paying guest on the date of the birthday. Just to be sure, pls call any Vikings branch. thanks. What if we go to vikings one day after the birthday of the celebrant? Can we still avail of the birthday promo? The celebrator eats for free within his/her bday month when accompanied by 4 paying adults, so it's 4+1. For further inquiries, pls call any Vikings branch. Thanks. Hi,my bday is May21,...im planning to celebrate on viking nextweek,..only 1-fullpayment companion lng po ba? remember Musical.ly password fairly quickly. Right here's ways Musical.ly Login this quickly after you obtain the e-mail or message. Yung number 4 anong meaning nun? Within the month po ba? Quick Shortcut Maker APK has an extremely quick shortcut maker download shortcuts that you cannot develop making use of the basic shortcut. hello guys this is a awesome place and good game our apps.and full information. get free robux. just use for game and gets free robuxz.its game very easliy level and itresting game. How about august 1 plano sa vikings nalang icelebrate ang birthday ng baby boy ko may promo ba ba? At paano?